The late 60s were a tumultuous time in Sierra Leone. In the span of two years, there had been three military coups. In 1968, Siaka Stevens assumed power as the Prime Minister, and after the country declared itself a Republic, became the President. During his rule, he was criticized for dictatorial methods of government in which many of his political opponents were executed, as well as for mismanaging the economy. On a positive note, he reduced the ethnic polarization in the government by incorporating members of various ethnic groups into the government. Sierra Leone’s music is a mixture of native and Colonial influences. A local version of Palm Wine Music – known as Maringa – evolved after Portuguese sailors introduced guitars to the region. Another key ingredient, was the influx of freed slaves that had come from the Caribbean and bringing new music styles from that region – especially Calypso music from Trinidad. During the 1970s, Sierra Leone was not left out of the electric Afropop explosion that was sweeping Africa. The result was a mix of Maringa blended with Funk, Soul, and Congolese Rumba. 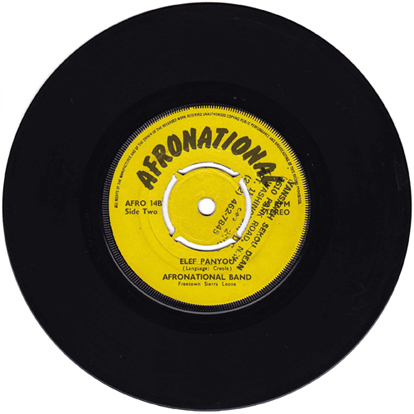 I have not been able to find hardly anything on the Afronational Band – also seen as “Afro-National” and “Afro National”. They are mentioned in just about every article on music from Sierra Leone, but beyond that there is not much to go on. If you have any information, please get in touch or leave comment. Catalog number AFRO 14A / 14B on Afronational of Freetown, Sierra Leone. No release date listed.